The acronym IPOB simply means the "Indigenous People of Biafra," and Its one and only certified leader is Mazi Nnamdi Kanu, deputized by Mazi Uche Mefor. It is appalling that most of our people out there still do not understand what Nnamdi Kanu - IPOB has been struggling to achieve over these years. As a result, they tend to have a jaundiced view of IPOB struggle to restore Biafra and will always wave away the idea of joining in the agitation for the Biafra restoration. Well, as Myles Munroe rightly wrote, "Where purpose is not known, abuse is inevitable." In trying to define the word "Purpose," Myles also wrote, "It is the original intent of the creation of things." According to him, "Purpose can only be found in the mind of the maker of a thing." People will always abuse something they don't know how it functions. For one to really understand how a thing works, one ought to read the "Manual" from the manufacturer. That is the only thing that will guide one in discovering the true reason why something exists. The real mission of Nnamdi Kanu - IPOB on this very earth is simple - to get Biafra. Nothing more, nothing less! The above clarification of the word, "purpose" by Myles Monroe has categorically explained why many individuals out there who lack the knowledge of what IPOB represents still try to prejudge Mazi Nnamdi Kanu without first knowing the reasons for his unorthodox act. Most of these IPOB critics are the agents of the Nigerian government, doing the work of their paymasters. They are the agents of Lucifer from the Pit of Hell. Their work is to continue to deceive and confuse some gullible ones among us so as to make them lose faith in Nnamdi Kanu-IPOB. The purpose of IPOB is no other thing but to restore Biafra. Through its leader, Mazi Nnamdi Kanu this mission can be achieved because he is an upright man and he is not after worldly things. Kanu, without the doubt, is willing to sacrifice even his own life for the course he believes in. Who does that if not a true leader. His upright nature has made it very difficult for the Nigerian politicians to bribe him to stop talking about Biafra. Of course, they tried countless of times to buy him off and had failed on each occasion. This explains why they had unleashed the Nigerian Military, Operation Python Dance II who invaded his family home at Afara Ukwu Ibeku in Umuahia in the late 2017 while his case was still at their Court, because they had felt that if Kanu should be allowed to continue on the path he was treading on, it would expose their lies and deceits, so they had to send their Janjaweed Soldiers from the pit of hell to kidnap him. Till date, Kanu's whereabouts have remained unknown. Who then is Mazi Nnamdi Kanu? "I am Nnamdi Kanu; I am the Voice of the Voiceless People of Biafra, Africa and the world at large. I am a representative of truth and Honesty, I am an epitome of Kindness and Love, I am a paragon of Liberty, I was born a libertarian, an activist, and Orator. I am Nnamdi Kanu, Radio Biafra is like a Child of my Brain, which through I have succeeded in airing my gospel of redemption to the world. I am Brave and never afraid to unveil the truth even before my enemies. I am Nnamdi Kanu, I am whiter than white and whiter than snow, and my mantra is (Eziokwu Bu Ndu) which means "Truth is life" in the Igbo language. I am Nnamdi Kanu; I was born to liberate my people (Biafrans) from this shackles of Darkness man-made contraption that has enslaved them since 1914." Besides what he said above about himself, Mazi Nnamdi Kanu is the prince of Afara-Ukwu Ibeku Biafra Land. He is a man of equitable status and he has come to raise a finger over the marginalization of his own people. Kanu, just like the Biblical Moses is a man who has come to say to the Nigerian government and its co-conspirators, "Enough is enough, let my people go!" He is a God sent. He is a man who has sacrificed even his Kingship (Like I have earlier pointed out that he is the Prince of Afara-Ukwu Ibeku Kingdom) just for the sakes of his own people, so that they will be free from the untold hardship that they have been over the years subjected to by the Nigerian political leaders who constantly run down their lives and feed on their signs of progress. Let me reaffirm this, the Nnamdi Kanu - IPOB only mission on this very earth is to restore God's kingdom (Biafra) back on earth and their only weapon with which they are fighting this great battle is the "Truth" - a weapon of mass destruction. Biafra as a people had existed before the advent of the White man in Africa. As a result of the white man's greed and his covetous desire to control Africa, this peaceful society called Biafra was joined together with other peoples (The Hausa-Fulani and the Yorubas) whose culture and tradition/ belief system are entirely alien to theirs. Since then, all hell was let loose. Of course, this was the handwork of Britain through their representative called Frederick Lord Luggard who created Nigeria in 1914 and had included these Godly people of Biafra into it. Since the creation of Nigeria by the white man in the aforesaid year, the center can no longer hold for this great people of God who are the descendants of "Gad," a man from the land of Israel, from the tribe of Jacob who had in the past migrated to find a home in Biafra Land right inside Africa. Should we blame those who are still having doubts over the IPOB efforts to get Biafra? The fact is, People are always afraid of the things they don't comprehend. Moreover, Most of our people out there are still hanging their fears on the failure of the previous groups that had fought for the Biafra restoration. They say, "when one finger touches the oil, it spreads to the rest." Such is the case here, but then, that really is an irrational thinking because IPOB never relents in its efforts to restore Biafra, as "Truth" and Honesty happens to be its watchword, and Patience and Persistence" are its major tools for combating the enemy. Again, many out there fear THE TRUTH IPOB is preaching and would do anything humanly possible to stop it. Just as the saying goes, "The guilty are always afraid." Let me once again reiterate here that the mission and purpose of IPOB are not to play the game of politics with the lives and freedom of its people just like other captions such as Ohaneze Ndi Igbo and the rest of its kind are currently doing. Never! The mission of Nnamdi Kanu-IPOB is simple - TO RESTORE BIAFRA! That is it, Biafra or death! Mazi Nnamdi Kanu also said that "The ideology of Biafra is the freedom, the emancipation of all the Biafran people which means that all the people bound genetically, culturally and by the same value system." "Nelson Mandela didn't live in a mansion. Mahatma Ghandi never lived in a mansion. Martin Luther King Junior never lived in a mansion. Che Guevara never lived in a mansion. What are you doing with the landed property? What are you doing with wealth if you are a freedom fighter? We work ourselves to put our money in Biafra. The glory of your people being free is your gain. 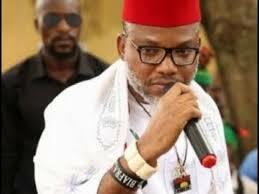 Nigeria can do anything it likes; I am interested in Biafra alone." "One thing is for certain, Biafra is coming. Nobody can stop it. No amount of intimidation, arrest, torture, deprivation will stop Biafra from coming. It is already ordained."